There are few products that I could just not resist. Mascara being one of them. I have this product Colorbar Lash Illusion Mascara Duo in carbon black which I will review for you today. Please to ignore the typos since sometimes, I forget to proof read! Packaging- Packaging is really good. Silver colored barrels or container with black wands jointed at the middle where Color bar is written. Both the barrels bear their names as lash lengthening and lash volumising. It really looks good. What the company claims- Colorbar Lash Illusion Mascara Duo in Carbon Black makes the eyelashes look naturally thick and long with its lash lengthening and lash volumizing formula. It prevents lashes from falling or breaking and is water resistant. This Mascara does not flake or clump and is suitable for sensitive eyes and those who wear contact lenses. My experience- I loved the packaging. It really looks nice. This mascara consists of two mascara wands and two barrels, one for the lengthening effect and the other is for voluminous lashes. You can either use one at a time as per your preference or can use both. It is true that it makes the lashes look longer and voluminous however, I didn't find any remarkable difference between the two formulations. I felt like it does a good job but sadly It does have a fair share of cons. It is not waterproof and clumps. Moreover, I do not like the way it smells. I noticed that the effect that i had by using both the formulations from this products, can also be achieved by using my good old Maybelline's hyper curl volume Express mascara which was at half the price. Packaging is really nice and looks stylish not cheap. Price is okay as you are getting two separate barrels or containers. It does makes your lashes look fuller and lengthier. It is pigmented and jet black. Two different formulations are there in one product. 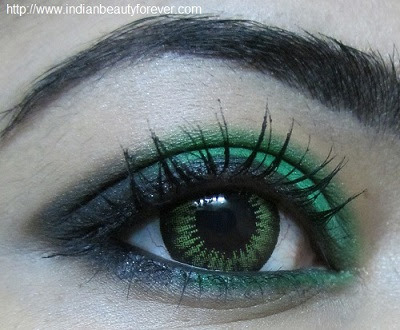 It does makes lashes longer and thicker but which can be also achieved by some other mascaras at lesser price. I do not like the way it smells. It has two different formulations but i don't see any remarkable difference in them. Ingredients list was not mentioned. It does clump so the claim that it doesn't clump is not true. My take- If you are looking for a mascara that makes your lashes longer and thicker then there is no harm in trying this. It is not a bad product, it does a good job. Though other cheaper options are also available..
hi niesha darling how r u?????? nice review btw..
nice review..I badly need a mascara now, my collossal one is good enough though ! I need a new black mascara. It changes the whole look. Thats right.. i just love black mascaras.. they have the ability to enhance the entire eyelook..
your eye liner looks awesome great post ! thats great then Vish, but i did not find it that good yaar.